I know it’s been a long time since the website was last updated and for that I apologise. It’s been a very busy couple of months; Sue started a full time job that has given her very little time to write anything while we moved out of our flat share and into a little 2 bed flat in Acton. I didn’t play much in May and June since the league seasons finished. Most of the time was spent looking for our new place and sorting out the move but I also managed to do some chess study before my busy Summer. 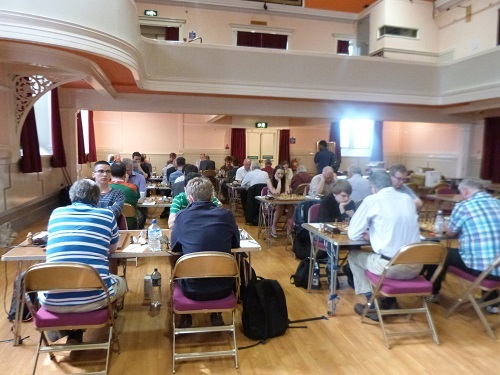 I played one chess tournament, a rapid one-day at King’s Place near King’s Cross. I managed to win it with 5.5/6, defeating David Howell with Black in the last round who had 5/5. It was an extremely strong tournament in a pleasant venue in Central London and hopefully will be repeated. At the start of July Sue had a week off work and so we decided to have a short holiday before the Scottish Championships started. We spent three days in Edinburgh and two in Glasgow which were very enjoyable. 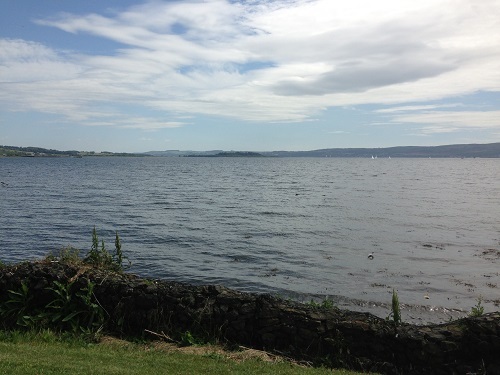 On Friday 5th July we headed to the small town of Helensburgh, just over 20 miles from Glasgow. It’s a pretty town on the extremely wide River Clyde and reminded us quite a lot of New Zealand. The weather for the previous week had been very hit and miss but during the tournament we were blessed with glorious hot, sunny weather and I was very grateful not to have been in sweltering London. For some reason the British arbiters have an addiction to accelerated pairings, despite almost universal criticism, especially from the titled players. Accelerated pairings mean that instead of a usual top half vs bottom half, the tournament is grouped into quarters and top quarter plays second and third plays bottom, for example if there were 60 players 1 would usually play 31 but this time 1 plays 16. Of course one reason the top players don’t like this is that we don’t get to play into the tournament with an easier pairing in round one and already in round one I had Black against a tough Scottish IM Douglas Bryson. Dougie doesn’t play much these days but still has very good theoretical knowledge and it was a battle to beat him. Giving the top players harder pairings, though, isn’t a reason why acceleration seems a bad idea. Arbiters argue that it makes the tournament more interesting as the first round isn’t so one-sided. This may be true but in fact there were no upsets at all until board 16 here. Another argument is that acceleration favours norm seekers but I’ve never been convinced. The main reason that we don’t like the system is how unfair it becomes. Generally with normal Swiss pairings the players on the same score will play roughly the same strength opposition, albeit one guy might be unlucky and have to be some hugely under-rated junior. However in round three of the group on 1.5/2 I played Loz Trent, a 2420 IM while the other players in the top half played a 1900, 2000, 1800 and 1700 respectively. This hardly helped Hjorvar’s chances of his final GM norm which were practically destroyed when he was paired with a 2050 in the next round on 2,5/3, so much for helping norm seekers. My final two gripes and then we’ll return to the tournament. It’s annoying not being able to predict the pairings but a more serious problem is that I think it jeopardises the final standings. After three rounds of acceleration a lot of players are out of place and it takes a long time for everyone to get back into the correct order. Especially in a tournament like the Scottish Championships where the highest placed Scottish player is unlikely to win the tournament then it’s important that the pairings are as fair as possible. At the British Championships last year I requested that we use normal Swiss pairings but acceleration was used. I warned at the time that this would mean all the top players would play in the first week and we’d have run out of opposition by the last round. Sure enough in the last round I had a big downfloat to play a 2246. Acceleration may be necessary in a tournament with a huge number of players and relatively few rounds but with 55 players and 9 rounds I think it’s ridiculous. Anyhow back to the chess. In round two the top 4 boards were all GM vs GM encounters, something which wasn’t repeated for the rest of the event. I had White against Danny Gormally and got some advantage with the English but Danny defended well and held the draw. As I have already mentioned I played commentator extraordinaire Lawrence Trent in round three. We were staying in the same place and he’d already told me he was having problems with his computer and so I expected a sideline. The game started 1.e4 c5 2.Nc3 and I decided to goad him into a Grand Prix Attack with 2…d6. Instead, after some thought, he tried 3.d4!? a move I’ve never seen before. After exchanging on d4 I had quite a long think about how the position compared to the more normal situation with knight on f3. I was happy with my decision making and played a good game. Round four was a bit of a disaster. White against Serbian GM Aleksa Strikovic I prepared a dangerous pawn sacrifice and was actually winning out of the opening. He defended very well and I missed the most accurate approach and the position became closer to equality. I then overlooked a rather simple tactic and blundered away my queen. Before the tournament I knew I would be a bit rusty and thought if I have to lose a game I’d prefer to lose it here than at the British or World Cup but I was still very annoyed at myself. I returned to the B+B and hit the gym and vowed to bounce back. Round 5 saw another peculiar pairing as I got another White, this time against Andrew Green, quite a dangerous opponent a few years younger than me. He hadn’t seen my opening before and I tricked him into a ‘Sniper’. I won a pawn and he didn’t really have any compensation and it wasn’t too difficult to convert. I was back to 3.5/5 but meanwhile Danny Gormally was storming away on 4.5, having dropped only that draw to me back in round 2. 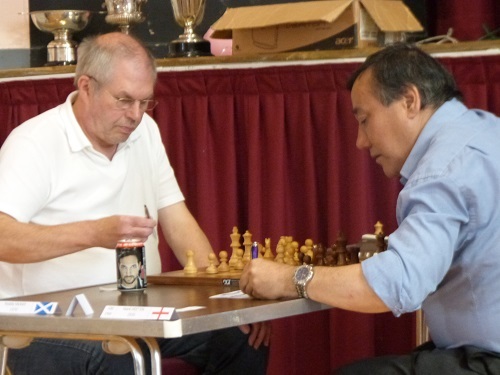 I managed to reduce the deficit to half a point in round six when he agreed a quick draw on board one while I managed to beat another very tough Scottish IM with Black, this time Craig Pritchett. The material was reduced to rook, two bishops, knight and three pawns each yet he still had some practical difficulties and erred. Round seven I was paired with Hungarian veteran GM Ivan Farago. In a pretty solid line of the French Defence I provoked him a little in the opening and then found a good piece sacrifice which shattered open his king and there didn’t seem to be a defence. Round eight I played another English GM, Mark Hebden. We’ve played each other pretty often by now. I followed a game of his where he had won in 16 moves for 13 moves before deviating. Practically it’s quite a good choice to follow one of your opponent’s wins if you have a good idea as your opponent is less likely to have studied the game in depth. 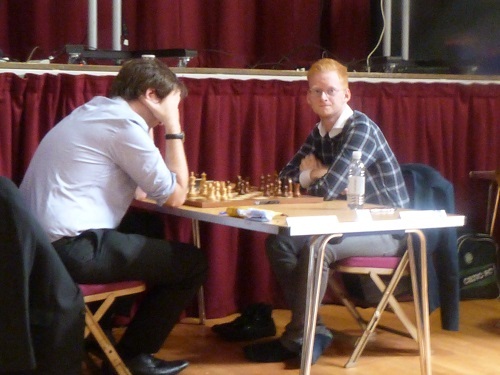 The position was quite complex and Mark spent a lot of time before erring and I reached a very pleasant endgame. However Mark made it very tricky and it took me a long time before I finally managed to convert the win. With Danny drawing on board one it meant I had finally caught him in the lead with four successive wins. Going into the last round we both had 6.5/8 followed by Imre Hera, Hjorvar Gretarsson and Aleksa Strikovic on 6/8 and Ivan Farago on 5.5. As Danny had already played me, Hjorvar and Strikovic we felt it was certain he’d play Hera. However, as we checked the pairings on Sue’s iphone (she’d made the long train trip to see me again the final weekend) we found he was playing Ivan Farago. We tried in vain to find contact details of the arbiters and walked to the venue but it was closed.